With the recent addition of the lightweight scrap between former UFC prospect Terry Etim and Patrick Cenoble to “Bellator: Rampage vs. Tito,” 12 fights have now been confirmed for the November 11 event. Long Beach Convention Center in Long Beach, California hosts the gig. Bellator is tearing a page out of the UFC’s playbook for their first pay-per-view show by streaming a handful of preliminary bouts live on their website, which immediately leads in to the remaining prelims on Spike TV. The PPV broadcast starts right after the freebie fights. 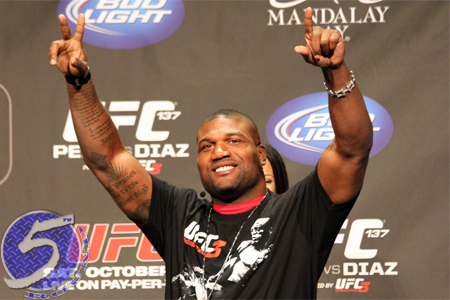 Thus far, the main card showcases three title bouts, the heavyweight tournament finals and the featured attraction between former UFC light heavyweight champions Quinton “Rampage” Jackson and Tito Ortiz. It’s possible Bellator will add one more to the event.